Three months on, my Raspberry Pi is still proving a delight. I have settled on the Raspbian distribution as my tinkerer’s habitat, giving me access to the floating-point unit in the glibc libraries (especially libm.so). However, being mostly uninitiated in Debian administration, I have spent some time learning “the Debian way” of doing things. This article will therefore be a shameless hodge-podge of Raspbian review and Debian ignorance, plus a handy (for me) trick at the end. Raspbian is a Debian-based distribution, tailored specifically for the Raspberry Pi’s hardware and capabilities. The Raspbian download isn’t actually an installer, but rather an image to copy to a 2G SD card, ready to boot, almost ready to run, and pre-configured for the Raspberry Pi’s on-board hardware. The kernel and X server are configured for maximum peripheral compatibility, so Raspbian should work with most (spec-conformant) USB keyboards, USB pointing devices, and HDMI or SDTV console displays. The CPU/GPU memory split is hard-coded into start.elf, so Broadcom provides three start.elf images, to give 32M, 64M, or 128M to the GPU for multimedia performance, and the remainder to the CPU. The 256M on-board RAM is not expandable. Until recently, pre-alpha releases of Raspbian came from independent developers. That changed on 2012-July-15, when Raspbian became an officially supported distubition with the Raspberry Pi project. Raspbian underwent much clean-up and stabilization for this change, including the addition of the Squeak and Scratch programming environments. I found every option useful, especially the keyboard layout and locale. Raspbian’s base configuration is for a British environment, which has various critical characters in different places on the console keyboard. I had to switch to a US keyboard layout, so that the double-quotes (“), at-sign (@), and hash mark (#) are where I need them to be. Without that, the attached keyboard would be very difficult for me to use. Enabling overscan is useful for shrinking the image, to compensate for my ancient composite monitor’s weak circuits. Changing the CPU/GPU memory split is buggy. I can copy the desired *_start.elf file to start.elf manually, then reboot, and the system has no complaint. However, using the “raspi-config” tool to choose the *_start.elf image results in a system that won’t boot. The “OK” LED flashes 6 times, indicating that “start.elf” failed a sanity check before receiving control. The fix is simply to pull the power, pull the SD card, insert the SD card into my desktop system, mount the first partition, and make the copy manually. After unmounting the partition and re-inserting the SD card into the Raspberry Pi, it boots just fine. I am grateful to the Raspberry Pi’s designers, that they decided to boot from the SD card: if the modifiable boot code were embedded in an EEPROM, this bug in “raspi-config” would require an expensive JTAG connection to fix. On my home network, I use DHCP, NFS, and NTP, so the very first thing I did as root was to add my group and user names with the proper ID (12346). That also gives me SSH access from my desktop, once I removed stale keys from the clients’ ~/.ssh/known_hosts. The DHCP server configuration was left over from previous tinkering; as long as the Ethernet address remains the same, the .18 address will be valid from anywhere on the network. Since the Raspberry Pi has no on-board clock, the time and date must be set either manually or from an external resource. Raspbian includes the “fake-hwclock” package, to maintain an illusion of a stopped clock during power-down. date -s "`ssh othermachine date`"
ssh root@raspbian-system date -s \"`date`\" # note backslashes! This will give at most a few seconds’ difference for password typing. Using NTP is the best option, if it can be made to work. I enabled XDMCP by commenting out the last line of /etc/X11/xdm/xdm-config (N.B. comments there use exclamation marks!). Since the Raspberry Pi is always on a trusted network (even in public, where it talks only to my netbook), I made all remote X servers accessible by uncommenting the “any host can get a login window” in /etc/X11/xdm/Xaccess. I launched XDM with “service xdm start” as root, followed by “netstat -ulnp” to confirm XDM was indeed listening for incoming display management requests. I could test the setup with “X -query zacchaeus” on my desktop; a login screen showed that the request was honored. Once remote login was proven to work, making XDM start at boot was just a matter of “update-rc.d xdm start 2 3 4 5” as root. Any proxy can be set for CLI programs using the environment variables “http_proxy” and “https_proxy”, so putting these into a profile script in /etc/profile.d/ will save a lot of time. Using a profile script to set proxies requires special options to “su” to keep the proxy variables, either “su -” to run profile init scripts, or “su -m” to keep the current environment. A plain “su” will discard most of the environment when switching to the root user, for security reasons. That last point is easy to forget, until an “apt-get update” suddenly reports “404 No such domain” with a functioning network connection. The “pi” user has three primary programming environments in stock Raspbian: Scratch, Squeak, and Python. The Python installation includes some games, available through the “Python Games” desktop icon (imagine that!). Scratch’s GUI uses the X shared memory extension, which works only on local video, but reports X protocol errors when run remotely. Without a USB mouse to run Scratch on the console, it is unavailable for me to explore. Because of licensing issues, a Squeak image or Squeak sources package is not available in Debian yet. So the user must download a proper image in order to get this script useful. The Squeak web page includes an All-In-One download link, which supports Intel architectures only. The Debian instructions involve adding two lines to /etc/apt/sources.list; the only other option for running Squeak on ARM seems to be building from source. I consider the lack of documentation in Raspbian for installing a Squeak VM image for Raspbian Squeak to be problematic. If a component has to be omitted from the stock image, the statement indicating this (in this case, the man page) should include the instructions for finding and installing that component. “Using” in this case might be a misnomer, since I don’t “use” the Raspberry Pi for regular work. The Raspberry Pi is more of a t… well, it isn’t a “toy” either. I suppose the best non-computer comparison is a set of metric wrenches for a car mechanic who has needed only Imperial wrenches so far. They do the same thing, but they’re different enough that the mechanic can now do basic work on European and Japanese cars. Since my purpose for the Raspberry Pi is mostly academic, Raspbian serves well to open up the capabilities of its hardware to my curious eyes. The configured LXDE environment has 2 virtual desktops. This may seem somewhat sparse, but it’s ready to build on, in keeping with the overall Raspberry Pi and Raspbian philosophies. I added the GKrellM system monitor, with its clock showing hours, minutes, and seconds for quick visual confirmation that the system is still up and operational. If the system’s CPU load is pegged at 100%, and the kernel panics, a plain load monitor shows no difference, but GKrellM shows immediately that the system time (and everything else) is stopped. I don’t use PCmanFM enough to say much about it, but it’s there for those who want it. I prefer to use the CLI for my file management. I made the switch to GCC 4.7 permanent, by removing the regular symlinks and creating new ones. This is a manual process, since Debian’s “update-alternatives” system doesn’t manage GCC versions. One of the first things I wanted to examine was the math library in /lib/arm-linux-gnueabihf/libm-2.13.so, to see how software used the floating-point unit in complicated calculations. I was surprised to find out that only the basic operations are available–addition, subtraction, multiplication, division, and square roots. There are no trigonometric or logarithmic instructions, so these are carried out through “manual” calculations instead, which are still faster thanks to the hardware floating-point acceleration. As I said above, I’m not pleased about being unable to run Scratch or Squeak in my current Raspbian environment. GCC doesn’t yet support linking Thumb and ARM HF (hardware-float) code. Using “-mthumb” with GCC gives a “sorry, unimplemented: Thumb-1 hard-float VFP ABI” error, so that means no Thumb code testing under a debugger. Generating the Thumb assembly is still an option, though. I would also like Jazelle support, but that isn’t Raspbian’s fault. ARM isn’t forthcoming with Jazelle documentation for public consumption, possibly due to licensing issues from Sun/Oracle. That makes Jazelle support unavailable for GPL’d code. I missed seeing “oprofile” and “ht” in the Raspbian repository. I was able to build both from source (“ht” needed the latest GCC), but “oprofile” fails to run properly. Even when I see no errors during setup, report generation fails when it succeeds on my desktop. None of these is a show-stopper. The ones that make me go “drat!” is the lack of Thumb support in the linker and the unusable Scratch and Squeak environments. If you ignore the three Android devices I own (don’t ask), the Raspberry Pi is the most portable of my general-purpose computing devices. Packed into its shipping box for protection, it fits into a large pants pocket, along with the network and power supply cables. Even my netbook isn’t that small or light. But that doesn’t mean Raspbian would be usable, without some way to receive input and display output. Carrying a keyboard and CRT would turn the RPi into my least portable device. Following the Unix philosophy of “simple tools for complex tasks” and “don’t re-invent the wheel,” I kept access to the GUI desktop, while reducing the Raspberry Pi’s connections to the bare minimum of two: the power supply and network. The power supply is a microUSB connector, just like the USB data cable connector on my Samsung Gem Android phone. Running the Gem’s data cable between my netbook’s USB port and the RPi’s power connector takes care of that need. echo "Enabling DHCP for Raspberry Pi access." Once the DHCP server is running on the netbook, all I need to do is connect the Ethernet ports, and then connect the netbook’s USB port to the RPi’s power connector. About 30 seconds later, the RPi will be ready for an XDM login. 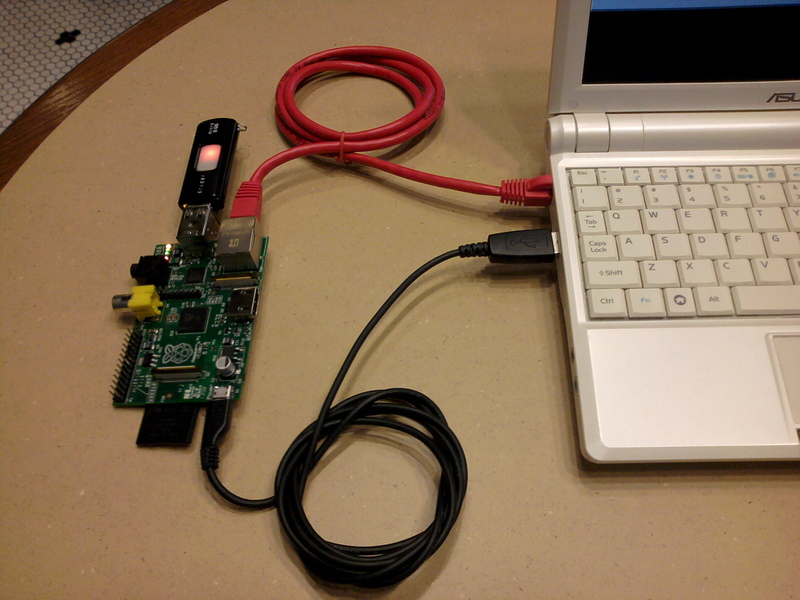 The Raspberry Pi and the netbook thus becomes peripherals for each other. 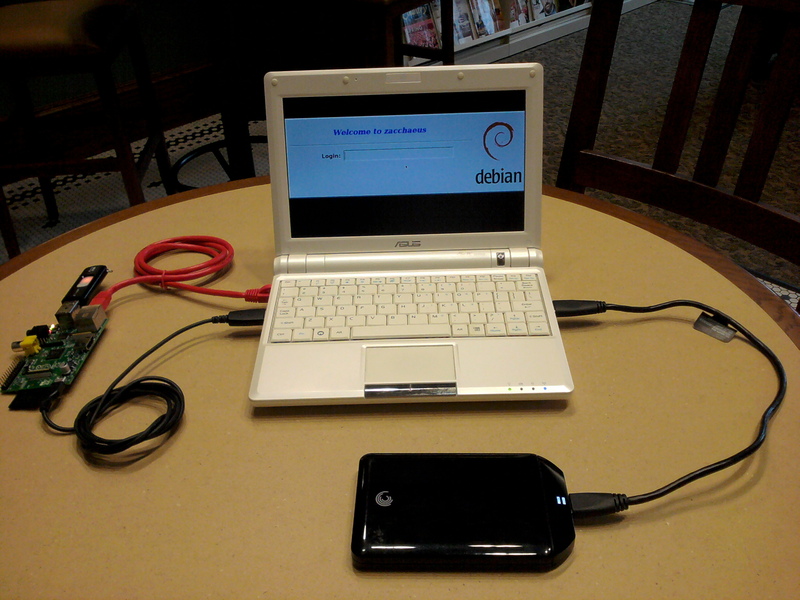 The netbook is a console for the RPi, and the RPi is a peripheral with its only connections to the netbook. I now have a setup that can give me a Raspbian login anywhere I go. Have you tried the Xbian fork? Hmmm, that does look interesting. One problem afflicting all the Raspbian distros is the reliance on the 3.1.9 kernel, which as the Xbian devs point out, is no longer supported. They now have the 3.2.27 kernel working on the RPi, so hopefully the other RPi distros can take up the example and get support from the Linux dev team.